Because Afraus received a good interest, last month I override shinyapps.io free plan limits. That got me move my Shiny App on an Amazon AWS instance. Well, it was not so straight forward: even if there is plenty of tutorials around the web, every one seems to miss a part: upgrading R version, removing shiny-server examples… And even having all info it is still quite a long, error-prone process. All this pain is removed by ramazon, an R package that I developed to take care of everything is needed to deploy a shiny app on an AWS instance. An early disclaimer for Windows users: only Apple OS X is supported at the moment. As one would expect, using ramazon is a very pleasant experience, given that you just have to run a function, ramazon(), passing to it the EC2 instance public_DNS and the name of the key pair file downloaded from amazon AWS. 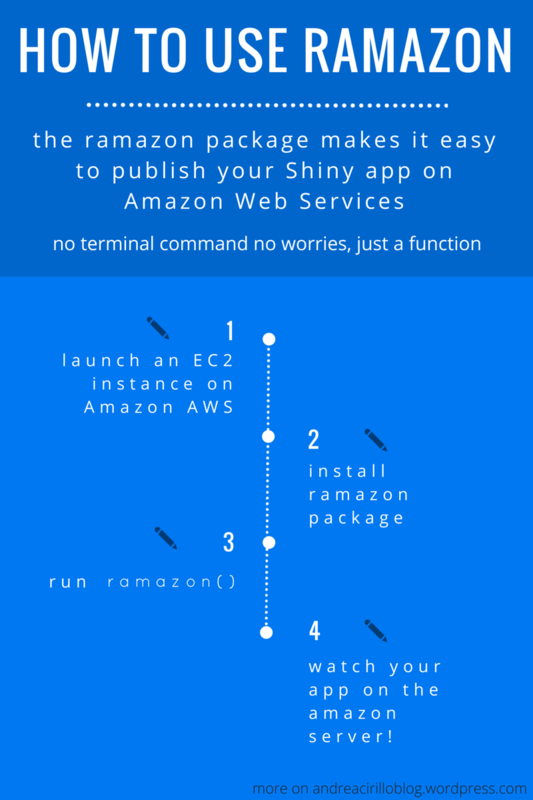 Just follow the following steps to deploy your app with ramazon. I am not going to go into details, I can see you are in a hurry to see your app on the Web, I will just show you screenshoots from the process. Be sure to change all parameters in accordance with the screenshots. 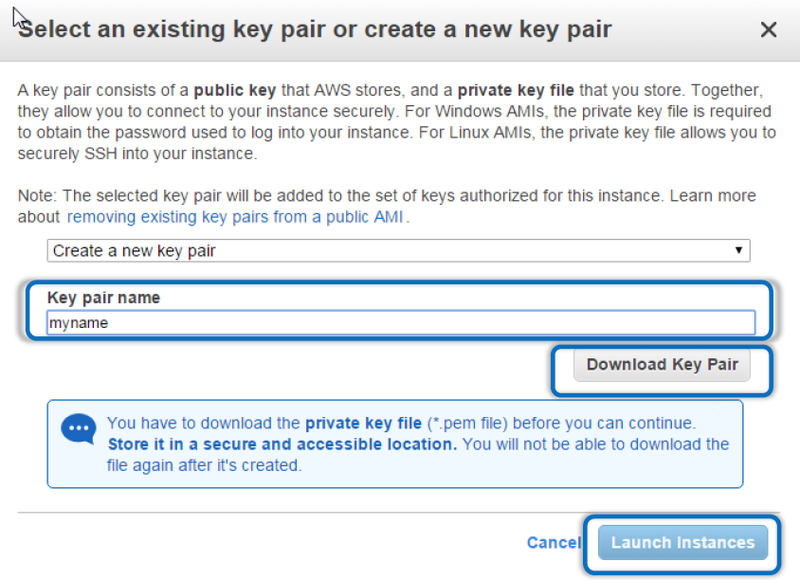 your key pair name is associated with the security group you choose for the ec2 instance. take note of it directly when creating the instance. after loading ramazon library you just need to run the following line of code, using the public DNS and key pair name ( without “.pem” extension into the name) you retrieved into the previous paragraphs: ramazon(Public_DNS ="your_Public_DNS", key_pair_name = "your_key_pair_name") after running this line you will see your console being populated by a lot of messages showing you what’s going on behind the scene (see next paragraph for more specific info about that). At the end of the process, ramazon will communicate that everything went smoothly and will print out the web URL where you can find your deployed app. the full ramazon code is released under MIT license on a github repo. Nevertheless, for those interested in code details I will describe in the next lines some details about ramazon design. All commands are run with verbose on, in order to give the clearest possible vision of what is going on and what could possibly go wrong. The resulting bash script is then run with system() function. Since the package is in its very first stages, I am aware of just a little part of possible issues that could arise during its use. In the meanwhile, find below three tricky problems that could arise during ramazon use. ramazon is trained to look for the key pair file within the shiny app folder. Therefore you have to save that file within this folder. If you are using the same key for different instances you can also copy and paste it into the shiny app. If you are using an online repository for your project, be sure to add your key pair to the .gitignore file. this was also kindly pointed out from Simon in comments: your .pem file should be in your working directory and your working directory should be the one hosting the app. It sometimes happens that the key pair file is saved as a txt file. This results in ramazon not being able to connect with AWS instance and failing its job. All you have to do in this case is to change the extension of the key pair file. as you can see within the deck showed above, the security group associated with your instance as an SSH connection rule (see slide 10) Even if this type is set with “My IP”, if this IP changes (i.e. you connect from another network) it will not update automatically. This again will result in ramazon failing its job, given that it will not be able to establish an SSH connection with the instance. All you will have to do in this case is to edit inbound rules for the security group and specify again “My IP” for the SSH Type. This will change the IP into your current IP. After trying ramazon (yeah, it worked 😌), @ukituki pointed me out a possible issue: the absence of a public DNS for a given instance. this issue comes from not checking the “Automatically assign a public IP address to your instances” during the launching process. I am already working on some further improving of the ramazon functionalities, like the update function to be run after the first deploy and some other facilities. Nevertheless I would really appreciate you coming back after using ramazon to tell me what you went wrong, preferably opening Github issues, what could be done better and what you would like to see. Ramazon package has been also covered within the practical Cookbook published by Packt: Rstudio for R Statistical Computing Cookbook.